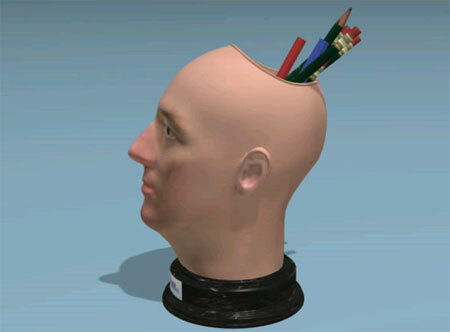 Turn Your Head Into A Pencil Holder | OhGizmo! By Chris Scott Barr on 12/18/08 • Leave a comment! I finished up my holiday shopping rather early this year, so for once I actually have an entire week to spare. For those of you still scrambling around for last-minute ideas, here’s one of the strangest that I’ve seen yet. ThatsMyFace is a website that offers, well, your face (or anyone else’s). What you do is head to their site and upload a frontal and profile picture. Within a couple of hours they’ll generate your “face profile” which is your face rendered in a variety of different styles. You can then pick out the one you like, and have it transformed into a statue. They have all different types available, with prices ranging from $29 all the way up to $2000. Talk about one creepy gift.